Even one of the central figures from last night's poor fare in Gibraltar admits that punters were more likely to turn off the TV and stick on the kettle instead of sticking around to watch the whole game. 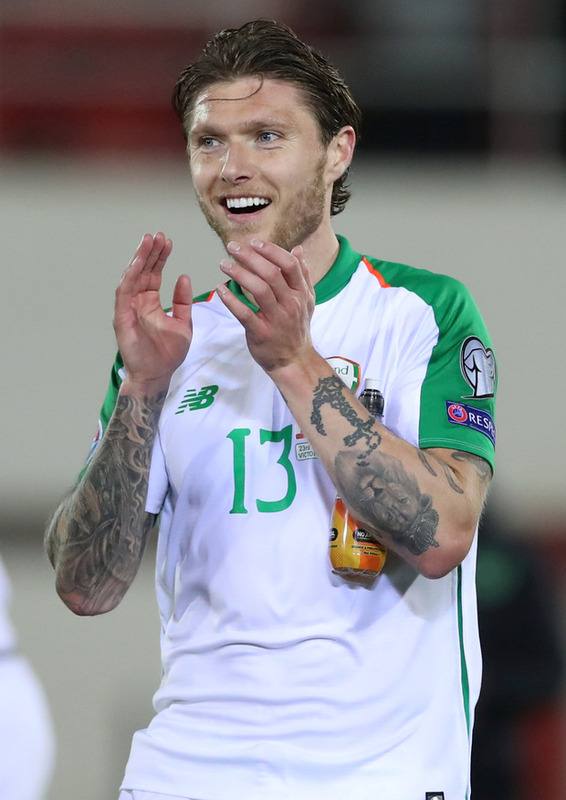 But Jeff Hendrick, scorer of the only goal of Ireland's first ever game on Gibraltar soil, maintains that Mick McCarthy's team can put the poor quality of the night behind them and look to the rest of the challenges on the road to Euro 2020 with the bonus of three points, and a clean sheet, banked. "It wasn't pretty. I'm sure a lot of people were out making cups of tea during that, pots of tea," said Hendrick. "For us, it was just about getting the job done, getting three points on the board and thankfully we did that. It was tough, the wind was swirling, the pitch is different to what we're used to. But you have to get on with it. Both teams are playing out there, the main thing is to get the three points. That's what we did, it's job done and we move on to the next one. "There was a lot of hard and bad games over the last year and for us, it was about turning it around and getting that positive momentum going. This was the first game, we got the win and got some of that momentum, we have to try and build on it. "There is a new feel, a new staff in, some new faces, some old faces as well but for us it's all about looking forward. Last year is done, we've just got to move on and start getting that positive momentum again." His goal was only the second time in his 46-cap Ireland career when he scored, and the Burnley player admits he needs to do more. "I'm happy to get the goal. The management and staff have been on to me saying one goal in 45 isn't enough and I knew that myself. We all know we didn't score enough goals last year, it's why we lost games. The more we score over this campaign, the better chance we have of getting points on the board," he added. Hendrick was partnered with Conor Hourihane in central midfield last night, his club-mate Robbie Brady having to settle for a place on the bench and then a role as a replacement for Matt Doherty, but Hendrick feels that working with Aston Villa man Hourihane is pointing towards a partnership that can work for the national team. "I enjoyed it, I've played with him a few times. He's really grown at Villa. Some of the balls he put in from in from set-plays were dangerous. It would have been nice had we got someone on them." Mick McCarthy was possibly speaking for all observers of the Ireland team when he admitted that he "hated every minute" of last night's narrow win. But the Ireland boss also conceded that he would settle for the same outcome, a win and a clean sheet, from every game in the group given that the time frame of the FAI management structure gives him just one campaign and one calendar year to get things right. "It was a horrible game. I did not enjoy one single minute of it. Gibraltar had nothing to lose and everything to gain - it was a horrible evening," McCarthy said after the first game of his second spell as national team manager. "It was blowing a gale, the surface was difficult but there are no excuses, we didn't play well but the only way to build momentum is by winning games. We've only got eight games in the campaign, so I'd take the same again if we get a 1-0 win. "This was set-up for an upset, playing on plastic, blowing a gale and against a good team that did alright. It was set up," he added. "I said to my staff that you turn up, you win, you get three points and then you can whinge all you want. But I'm not inclined to do that. I know we can play better. We'll probably play better and lose a game. He added: "I hope they play like that against everyone. It's up to them to come here and win just like we did. Let's give that team that played against us credit, because they were particularly stubborn."